It’s a classic “good news/bad news” scenario, but one that offers a ray of hope or sunshine to recent workforce entrants, college students, and those on their way up through the US secondary school system. If you run this Google Search, you’ll observe immediately that a host of publications, educators, and certification sponsors (including CompTIA, Microsoft, Cisco, and others) are opining about a looming “skills gap” in IT. 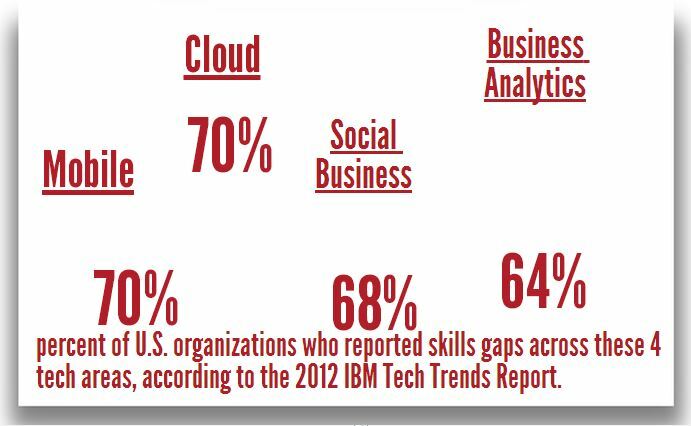 What it boils down to is that an increasing number of jobs is expected to remain unfilled over the next decade, as employers seek candidates with computing skills (especially in the areas of data analytics, cloud computing, project management, and software development) who may or may not present themselves to answer their needs. Some sources, including Forbes, The Huffington Post, and CIO.com, all share projections of a shortfall between these kinds of IT jobs available over the next few years and the people to fill them on the order of millions of unfilled positions per year. Some estimates for global needs indicate potential shortfalls of 5-7 million job candidates for IT work by 2020, of which as much as 20% could be in North America. What does this mean for aspiring and practicing IT professionals? Clearly, it provides areas of technical focus that could and should be career-enhancing, given the right education, training, and technical skills and knowledge. It also provides information that parents and educators should find useful in steering young folks toward potentially rewarding careers in IT. But most of all, I think it speaks to a need to re-work our primary and secondary curricula, not just to place more emphasis on STEM (Science, Technology, Engineering, and Mathematics), but also to build technology components around computing and information technology into as many aspects of the curriculum as possible. One thing seems certain: in no matter what field a person decides to work in the future, they will be using information technology and computing as part and parcel of their workaday activities. Basic computer literacy is essential, with enough exposure to computer science and information technology (particularly analytics) to help them appreciate its value and meaning for all areas of work. The IT skills gap may be a looming future problem for employers, but it is also a great opportunity for educators and the generation on its way through that system — but only if we act to provide the right training and exposure to close it.